Allan Katz, who also wrote the script, steals the show here as Bob Maloogalooga-Loogaloogalooga mainly because, for all his grunts and rampaging, he never forgets to make his wild man character lovable. 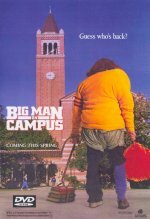 Mr Looga is a feral man discovered living secretly on a Californian university campus. Melora Hardin plays the student who volunteers to civilise him, investing her role with a sweetness that's both fresh and amazingly lifelike. As engaging as the film is, it's more pleasant than laugh-out-loud funny.